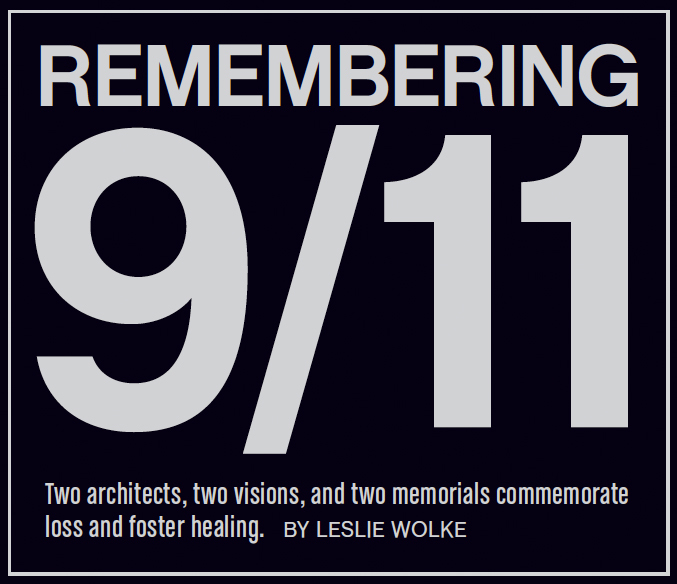 The terrorist attacks of September 11, 2001 endure as indelible visions of chaos, destruction and unimagined brutality. About two billion people — one-third of the world’s population — watched the day’s tragedies as they unfolded live on television and online. Within 24 hours, another two billion learned of the succession of catastrophes, which were to be the most widely witnessed events in human history. While the world watched in the days and weeks afterward, two architects in New York City began to draw. “I started to draw that night,” remembered Frederic Schwartz, principal of his own architecture/planning practice and long-time SoHo resident. 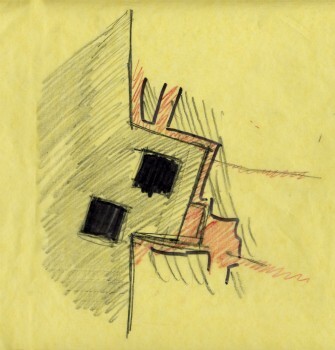 “It was my way of getting it out, what was seared in my memory.” He began by drawing the collapsing towers and over time, “I started to redraw the skyline. I started to draw what should happen,” he said. Michael Arad’s sketch on the left. Ten years later, the twin voids bear our collective grief. A decade of consequences and contemplation have passed and those early drawings by Schwartz and Arad have transformed from paper musings into the two most profound memorials to the victims of September 11th: Arad’s National September 11 Memorial at the World Trade Center and across the Hudson River, Schwartz’ New Jersey 9/11 Memorial in Liberty State Park. Both were dedicated and opened to the public on the tenth anniversary earlier this year. The purpose of modern memorials is two-fold: to commemorate the grief of victims’ families today and to convey the gravity of their loss to future generations. It is a daunting assignment to design for these intimate and immortal roles at once, and even more challenging to do so within the vortex of political, social, and cultural distress unleashed by these attacks. Both Schwartz and Arad entered this vortex through public competitions. For the 2003 WTC site memorial competition sponsored by the Lower Manhattan Development Corporation, Michael Arad submitted his concept for the twin voids, named Reflecting Absence. After six weeks of deliberations by the 13-member jury and some modifications to the concept, his design was chosen as the winner among the eight finalists. 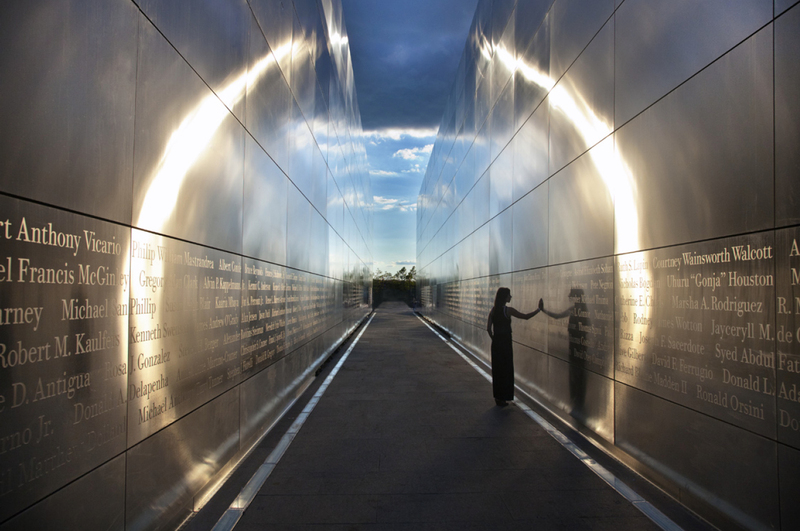 In 2004, Frederic Schwartz submitted a memorial design entitled Empty Sky to the New Jersey 9/11 Memorial Foundation public call for entries. His concept, a pair of steel walls framing the view of where the towers stood, was unanimously selected by the foundation’s Family & Survivor Committee. By this time, he was already a veteran of post-9/11 planning initiatives, having partnered with architects Rafael Viñoly, Ken Smith and Shigeru Ban under the team name Think to design a masterplan for the World Trade Center site. As one of two finalists to envision how the site should be rebuilt, the Think team narrowly and controversially lost to Studio Daniel Libeskind in 2003. From his earliest sketch to the fully realized incarnation, Arad envisioned Reflecting Absence as a plaza framing the two sunken pools that articulate the footprints of the towers. Streaming down the granite-clad walls from each side is a curtain of water, bathing the plaza with a constant of sound of rushing water. From the bottom of the waterfalls, the water drifts toward the center where it drops into what appears to be a bottomless chasm. Early on, Arad and his design team dismissed common patterns of categorizing names on memorials; date of death, as in the Vietnam Veterans Memorial, did not apply in these tragic circumstances. Another standby, alphabetical listings would not honor the individuality and singularity of each person. Knowing that 40% of the victims’ families had nothing to bury, Arad grasped that this memorial would be used as a gravesite for grieving and remembering. The act of scanning an alphabetized column, such one that would include the three people named “Michael Lynch,” would diminish that sense of intimate connection to a single person. In his effort to achieve a “deep, personal, particular meaning in the arrangement” of names, Michael Arad created the concept of “meaningful adjacencies.” Following the wishes of the families, the names would be collected in nine groups: the two towers, the four flights, the Pentagon, the 1993 victims, and the first responders by department/division. 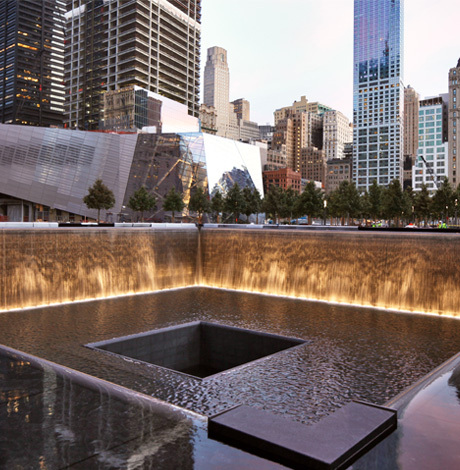 Victims in the north tower would be recognized on the north pool panels; and south tower at the south pool. Within each group, names would appear to be randomly placed in staggered lines across five rows. The randomness paralleled the indiscriminate and arbitrary killing of these individuals. In 2009, with Mayor Bloomberg’s help, the wishes of the families were collected: over 1,600 requests poured in. 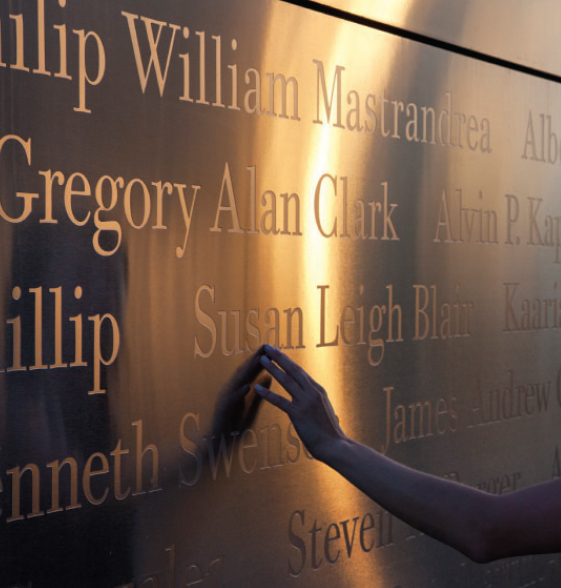 Requests to connect brothers, fathers and daughters, fiancés, friends, colleagues and strangers who tried to help each other on September 11 — hundreds of stories and personal relationships to be honored. At the time, no one knew whether it was logistically possible to accommodate all the requests, especially within the nine groups as already defined. A statistician hired by the memorial foundation concluded that there was zero chance of completing the puzzle to everyone’s satisfaction. Local Projects created a drag-and-drop software tool that tracked each request and maintained a tally of how close any composition came to fulfilling every adjacency request. Users of the tool could “pick up” a name, place it in a new location among the rows and panels, and see whether a given move improved or reduced the percentage of met requests. With a deadline to complete the memorial by the tenth anniversary — and without knowing whether 100% of requests could indeed be fulfilled within the geographic and physical constraints of the design, Arad and Barton undertook parallel high-tech and low-tech sprints. “It was a tremendous gamble” Arad remembers, having expressed his intentions to the families, “we became engaged in months and months of hard work” to make it all happen. On the high-tech route, foundation members and Arad’s team used Barton’s software tool to program the North pool. At the same time, Amanda Mangold-Sachs, an associate at Arad’s firm Handel Architects began to compose the South pool by hand by herself. Using quarter-scale cards which included the person’s name, group and adjacency requests, she spent months shifting and sorting the arrangements on 2 1/2 foot racks. “It was a labor of love that took patience and perseverance” Arad remembers. Both the high-tech and low-tech efforts succeeded in fulfilling all the requests; the composition was complete as what Arad called “an endless ribbon with a regular grain, or visual density.” The names are cut through 1/2-inch bronze panels illuminated from below at night. Arad selected the font Optima Medium Standard and his designers modified it into a stencil to accommodate the counters (the enclosed negative space within letters like “a” and “b”) with discrete pinned supports. Group names are CNC-milled as raised and attenuated prismatic letters. To find an individual’s name, visitors to the memorial can get directions from the Memorial Guide website, mobile app and onsite kiosks, all designed by Local Projects. Beyond their role in name arrangement and wayfinding for the memorial, Barton and his firm have taken on the role of storytellers and archivists of September 11. In partnership with StoryCorps, the nonprofit national oral history project, Local Projects has developed what Barton describes as “storytelling engines — participatory interfaces that are open and dynamic, that correspond to the fluid, and interdependent nature of storytelling.” Their efforts to record, catalog and publish stories about the events are to serve a universal mission “tell the enormity and diversity of the tragedy — to dimensionalize each individual and their story.” People will interact with this living archive, and add to it, on websites, apps, and in the museum when it opens next year. Just west of the tip of lower Manhattan and at the confluence of the Hudson River and Atlantic Ocean, Liberty State Park played many roles in the events of September 11 and its aftermath. During the attacks, Jersey City residents and office workers gathered on the shore, witnessing the burning and collapse of the towers. Soon after, dozens of private, commercial and Coast Guard boats shuttled evacuees from lower Manhattan to the docks at the park in the largest boatlift ever undertaken. In the following days and weeks, volunteers manned a family assistance center in the former railroad terminal on the grounds while spontaneous memorials sprung up at the waters’ edge. The families of the New Jersey victims of the attacks organized as the New Jersey 9/11 Memorial Foundation and chose this site to honor their dead. In June of 2004, they selected Fred Schwartz’ design, Empty Sky. To frame the Empty Sky of its title, the corridor shaped by these walls draws the eye, like a diagrammatic one-point perspective to the cavity in the Manhattan skyline where the twin towers once stood. The site and its orientation toward the towers was the starting point for Schwartz’ design. “The empty space left by the towers is as significant as the towers themselves,” he explained. With 1 World Trade Center (formerly the Freedom Tower) rising to the north, this area of the horizon is still void. On September 11, 2011, Michael Arad, Jake Barton, Fred Schwartz and Alex Isley all participated in the dedication of the memorials they conceived. 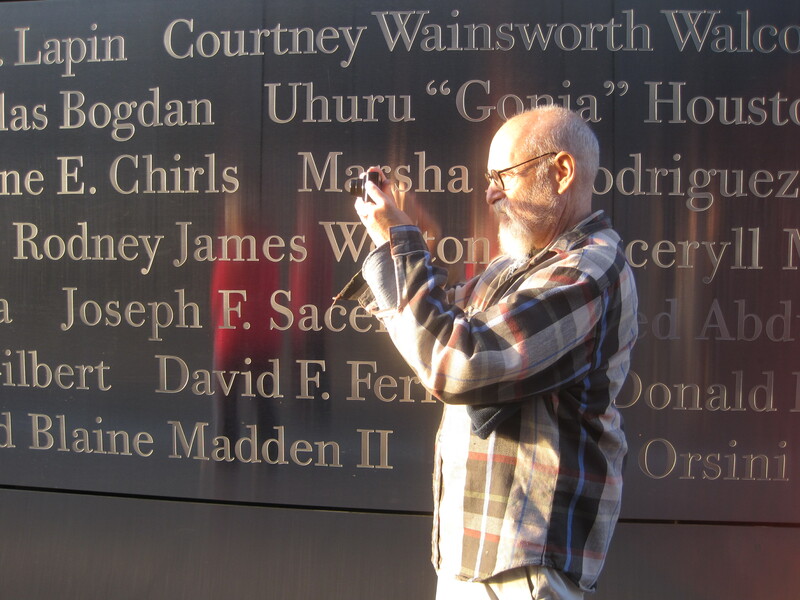 Fred Schwartz at the New Jersey 9/11 Memorial. 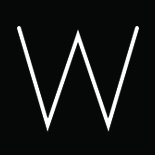 Leslie Wolke, SEGD (leslie.wolke@gmail.com) is a consultant who specializes in wayfinding technology and interactive donor recognition systems.